There are so many highlights and attractions to enjoy on a trip to Phillip island. From pristine beaches and wildlife conservation parks to Heritage farms and and quaint towns set on a jaw dropping backdrop. Amongst all these is surely the highlight of the day and one of the most popular wildlife attractions in the world – The Penguin Parade. What is the Penguin Parade? purpose is to educate people about the world’s smallest penguin – the little penguin. What makes it such a special experience is the penguin viewing where hundreds to thousands of penguins returning home to their burrows at sunset. 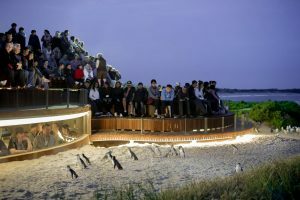 The Boardwalks and seating areas as well as specialised lighting make sure there is minimal impact on the penguins as people gather to watch. But what exactly made the need for the penguin parade to be built? Phillip island itself was discovered in 1798 by explorer George bass but we won’t go back that far. 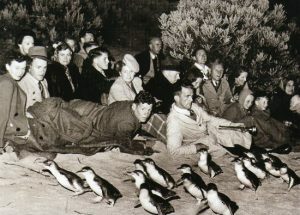 In the 1920’s local residents Bert Watchorn, Bern Denham and Bert West started guiding tourist by torchlight to watch the penguins return to their burrows on Summerland Beach. A ferry had just started transporting passengers to the island making access a lot easier. People would come along with their picnic blankets and without realising it crush the burrows of the penguins and destroy the vegetation. Some would bring their dogs along which also lead to some of the creatures being attacked and killed. 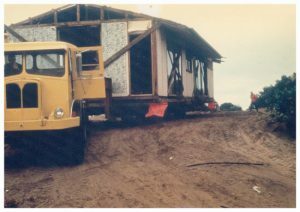 In the late 1920’s Summerland was divided into 774 housing allotments and people began building holiday houses. The first Bridge to Phillip island was built in 1939 allowing even easier access and driving tourism numbers and housing up even further. The Bridge was constructed out of wood and had a very strict weight limit. In 1955 the department of fisheries and wildlife realised the impact this was having on the population of the penguins and constructed fences and concrete viewing stand to control access to the area and try minimise impact. A new concrete bridge was constructed in the late 60’s again increasing ease of access to the island for tourists. announced. This was due to the massive decline in the population of the penguins themselves who had gone from 13 colonies and 70,000 in number to just 3 colonies and 13,000 in number. There were many reasons behind this decline from the human impact to destroyed vegetation and houses being built in the middle of the colonies to predators such as foxes that can kill up to 40 penguins in a night! The penguin management plan included scientific research, fox management and also a buyback program for houses in summerland. This is still considered a world first where a town has been rebought in the name of wildlife conservation. The Government bought back all the houses that were located on the summerland peninsula and replanted the native vegetation the penguins needed to thrive. The buyback was completed in 2011.
increasing. Over 6000 of those penguins call the parade their home allowing for the viewing of 200 to 2000 penguins returning to their burrows from the viewing platforms each night. 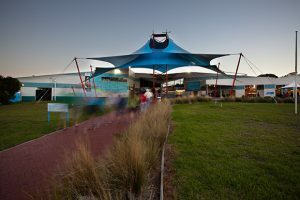 Phillip island Nature parks is a non for profit organisation meaning that all money that is spent at the park itself is reinvested in the interest of the wildlife on the Island. This year (2018) the visitors centre is receiving a major upgrade with the visitor car park being relocated away from the centre to avoid penguins walking through it and being run over. The old car park will become a revegetated area. 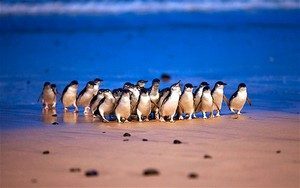 can walk along and enjoy the chance of seeing little penguins in their nests and also check out the Seal Rocks which are home to thousands of Australian Fur Seals. Inside the centre is information as well as the Antarctic Journey which teaches you more about the world’s most extreme continent. Leaving the nobbies there is a dirt track along the coast line where you have the chance to view wallabies and penguins in their burrows before arriving back at the Penguin Parade. The visitors centre in the penguin parade has various food stalls where you can purchase popcorn, hot drinks, pies or even a full meal from the restaurant. There is a cinema that plays informative videos and a great information area for educating yourself on all their is to know about the little penguins. There is a gift shop that sells all sorts of memorabilia for you to take home for yourself or loved ones. Heading out to the viewing areas there are a couple of different options which are listed below. Standard viewing – This is the main grandstand that is included in the price of your ticket. It is recommended to arrive early for a good seat and for the ranger talk. Watch a couple of groups of penguins arrive and then walk back along the boardwalks to discover penguins everywhere! Penguins Plus – Situated next to the main path of penguins, and limited to 190 people, Penguins Plus offers fantastic up close viewing of penguins. Based on research undertaken 70% more penguins access the beach via this area. Penguins Plus Underground – Up close viewing of the penguins in an enclosed area limited to 70 people. Guided Ranger Tours – Reserved front row seats on the sand (general viewing area) and access to Penguins Plus with a small group & ranger guide. VIP Tour – VIP treatment, elevated views and a close encounter with penguins on this ranger guided tour along with access to Penguins Plus. Make the Penguin Parade part of your adventure Today with a Full Day Tour or Afternoon Tour. Vｅry good information. Lucky me I discovered your site by chance (stumbleupon). back to your site for mоre soօn.